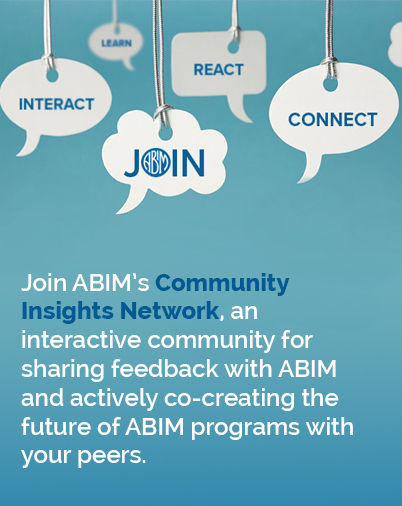 ABIM continues our work to provide you more choice, relevance and convenience. In addition to introducing the new option for maintaining certification—the two-year ABIM Knowledge Check-In you can take in your home or office—in Internal Medicine and Nephrology, we are working to expand new options across all subspecialties. We wanted to thank you for your input and provide an update about our progress to date. In 2018, certified internists and certified nephrologists will have the option to take an open-book long-form assessment every 10 years (ABIM’s 10-year exam) or an open-book Knowledge Check-In every two years. Open-book assessments will provide access to an external resource. You’ll have more options for when and where you take the two-year Knowledge Check-In, and immediate results will be available for most physicians after a Knowledge Check-In. If your certification in Internal Medicine or Nephrology is expiring in 2018 and you want to remain certified, you must take either the open-book long-form assessment or open-book Knowledge Check-In in 2018, in addition to meeting your other program requirements. When the Knowledge Check-In is piloted in 2018, it will be non-consequential for those who do not pass. This means that if your certification expires in 2018 and you are unsuccessful on the 2018 Knowledge Check-in, you will be able to take it again without a change in your certification status. This will help ABIM gain experience with this new approach, and make improvements for future administrations. The blog includes a tentative timeline for introducing the Knowledge Check-In across other subspecialties through 2019 and 2020, with one subspecialty following in 2023. We are working to introduce open-book Knowledge Check-Ins and open-book long-form assessments on a similar timeline for other subspecialties.